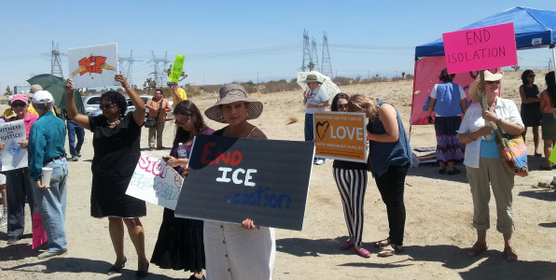 Community Initiatives for Visiting Immigrants in Confinement (CIVIC), a national advocacy organization, filed a complaint today, calling for a federal investigation into the visitation policies and practices at Adelanto Detention Facility and termination of Immigration & Customs Enforcement (ICE)’s contract with Adelanto Detention Facility. January 18, 2017 – Adelanto, CA – Community Initiatives for Visiting Immigrants in Confinement (CIVIC) has filed a formal complaint with the Office for Civil Rights & Civil Liberties within the Department of Homeland Security on behalf of the people who are currently or were previously detained at the Adelanto Detention Facility (ADF) in Adelanto, California. The complaint details frequent violations of federal standards regarding social and legal visits to persons in the custody of U.S. Immigration and Customs Enforcement (ICE). Since its inception as an immigration detention facility, ADF’s denial and restriction of visitor access has been well documented. Recently, however, advocates have witnessed a disturbing increase in wait times and visitation denials at ADF. These denials may be indicative of an emerging pattern or practice at ADF, and perhaps in other detention facilities as well. For example, CIVIC has been denied tours under ICE’s Stakeholder Tour Directive by other California-based immigration detention facilities, specifically the Theo Lacy Facility on December 7, 2016, and the Rio Cosumnes Correctional Center on December 9, 2016, and provided with no reasoning. The complainants are people in immigration detention at ADF, as well as their attorneys, family members, and community members, who reported on visit denials or unreasonable waiting times to CIVIC during 2015 and 2016. One of the women, Maria Richards, who has been released from ADF recently, is stating her allegation publicly. Maria experienced a family visit denial on September 9, 2016. Her husband and two sons, aged 7 and 12 years old, drove three hours to visit her so that they could celebrate her husband’s birthday together. After waiting for two hours, GEO staff told her family that they could not have the visit, and so they began the three-hour drive back home, distraught that they were not able to see their wife and mother. “My family and I were devastated,” said Richards, who was previously detained at ADF. As evidenced by the individuals included in the complaint, ADF fails to meet the visitation standards outlined in its contract with ICE. Access to detention facilities is even more important now with the incoming new administration. Detention facilities must follow visitation policies so that families can visit their loved ones and communities are able to safeguard against abuse behind closed doors. 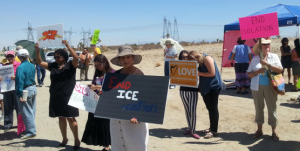 As part of a strategy to ensure that detention facilities such as ADF are required to abide by ICE’s visitation standards, advocates in California have re-introduced the Dignity Not Detention Act, which is co-sponsored by CIVIC and the Immigrant Legal Resource Center (ILRC). The Dignity Not Detention Act directly addresses the findings of Homeland Security’s recent investigation of for-profit facilities, which found the mistreatment of immigrants in confinement to be systemic and especially stark in for-profit facilities, such as ADF. The Dignity Not Detention Act will prohibit local cities and counties from entering into new contracts with private, for-profit companies to operate immigration detention facilities in California. It also will require all detention facilities to uphold national humane treatment standards, including those on social and legal visitation.